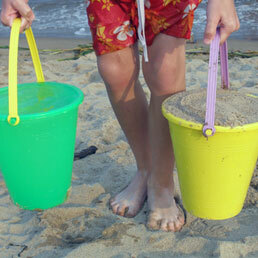 Which is heavier: a bucket full of water or a bucket full of sand? The materials take up the same amount of space, but do they weigh the same? The answer isn't obvious; it requires some thought and careful measurement. In these investigations, we return to our collection of earth materials to focus on the relationship between weight, volume, and material. We call the weight–volume relationship "heaviness for size." It lays the foundation for the important property of density, which scientists use to distinguish one earth material from another. Students weigh samples of earth materials on digital scales and judge volume by eye. They create tables and weight lines to represent their data, and then consider the benefits and limitations of each representation. As they investigate the materials in this new way, students come to understand that weight and volume are separate properties of earth materials, and that some materials are heavier for their size than others. 2.1 Same volume, same weight? 2.2 What makes a good weight line? 2.3 What can a good weight line show us about our earth materials? 2.4 Same weight, same volume? The Child: Why is density so hard for students to learn and for teachers to teach? The Weight Line Concept Cartoon is part of Investigation 2.2 What makes a good weight line?.